Disclaimer: This post has been sponsored by ALDI and written by me. All opinions are my own. An easy to make low carb white sauce pizza recipe. The crust cooks right in the pan with no rolling required. It’s sure to become a regular! It’s a new year and a lot of people have recently turned to the low carb diet to lose weight and improve health. However, many newbies have trouble in the beginning as they miss their favorite foods. 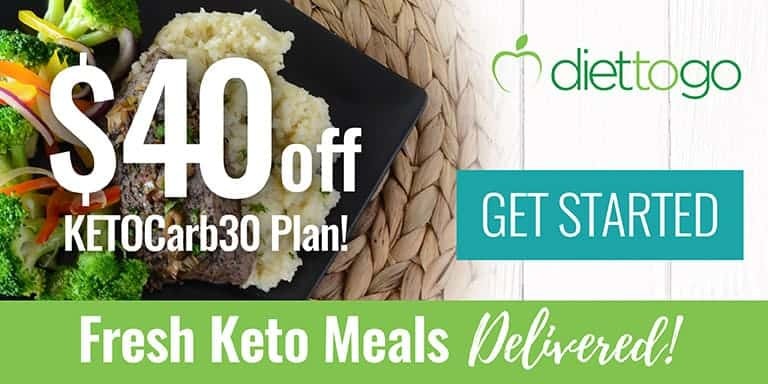 And, to make matters worse, those new to the diet find that their grocery bill has gone up after switching to low carb foods. But, it doesn’t have to be that way! 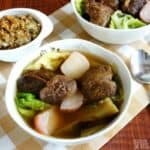 If you stick to the basics of the diet, you can make a lot of delicious food without spending a lot of money. Staples for low carb include eggs, cheese, heavy cream, meats, and low carb vegetables. All of these foods can be purchased at ALDI for much less than regular grocery stores. Just check out my prosciutto wrapped asparagus recipe where I saved about 50% on ingredients by shopping at my local ALDI. 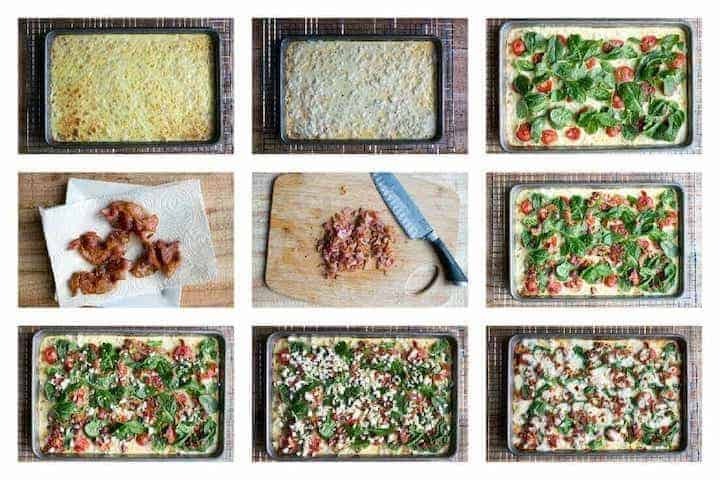 My low carb pizza casserole is one of my favorite dishes and it’s been a very popular recipe at Low Carb Yum. It uses an egg and cheese based low carb pizza crust that bakes up in the pan. So, there’s no need to roll out a dough! The original recipe used a 9×13-inch casserole pan so the crust it a bit thick. But, I got the idea to make a thinner crust by using a larger 10×15-inch jelly roll pan from reading a post in a low carb Facebook group. 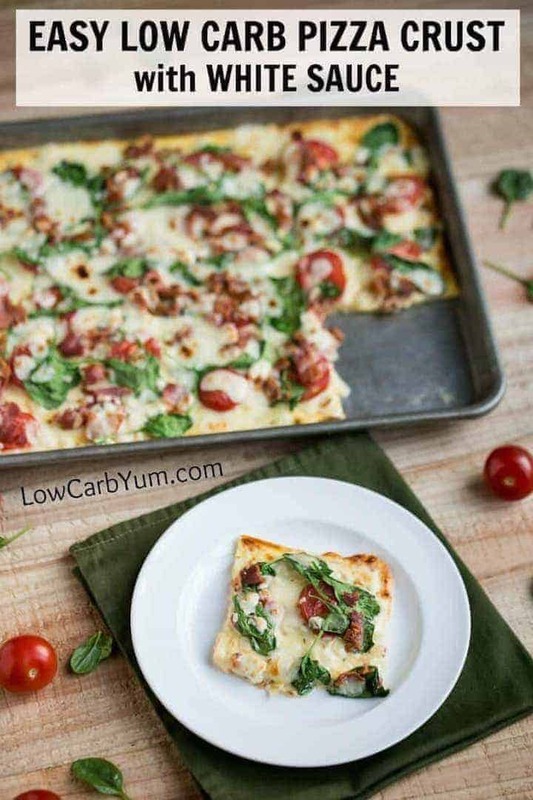 Using the basic idea of the pizza casserole, you can easily make a low carb thin crust sheet pizza. And, all the ingredients can be purchased at ALDI so you won’t have to spent a lot of money on the recipe. 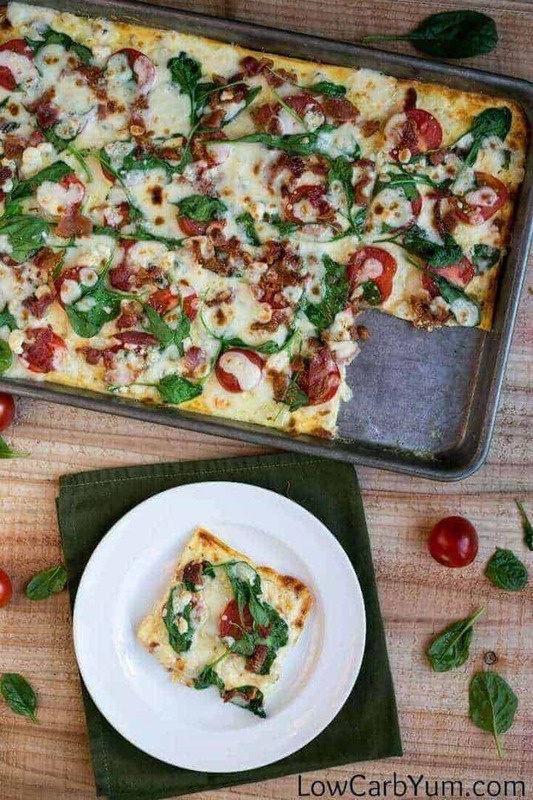 The total price for all the ingredients to make this low carb white pizza with gluten free crust, including the spinach, tomato and bacon toppings, was a mere $26.06* at ALDI. Try to get that price at your local grocery store! For comparison of ALDI brands to national brands, lets look at the dairy aisle ingredients. The Goldhen eggs, heavy whipping cream, Happy Farms cream cheese, Happy Farms mozzarella cheese, Happy Farms blue cheese, and at ALDI totaled only $8.92. * The price for comparable national brand ingredients at another grocery store cost me $25.06*. That’s a huge savings! 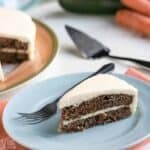 Of course, many of the ingredients were not used up completely in this recipe. So, you’ll have plenty of leftovers to make another pizza. 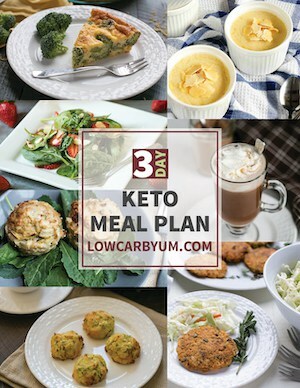 Or, you can use the ingredients for other low carb recipes. When I think of thin crust pizza, I often think of the brick oven pizza restaurants in my area. Before going low carb, my favorite brick oven pizza used a white sauce topped with bacon, spinach, tomatoes and cheese. 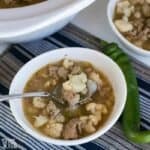 This recipe is a low carb version of that white pizza I used to order. And, the taste is pretty close to the real thing. But, this white sauce pizza is made with a gluten free low carb pizza crust. In my opinion, ALDI sells the best cheese around and they do it at a cost much lower than other stores in my area. I usually come out of ALDI with a huge stock of gourmet and regular cheese. For this low carb white pizza, I used cream cheese, Parmesan cheese, blue cheese, and mozzarella cheese. You can certainly change up the cheese to suit your own taste. ALDI offers a wide selection of cheese. I love the European cheese they offer. During my most recent trip, I picked up a Manchego cheese imported from Spain that was super delicious. I sprinkled on a little blue cheese in with the toppings on this white pizza. It gives a little “bite” to the flavor. But, feel free to leave it out or replace it if you aren’t a fan. You won’t have any trouble finding yummy toppings for this low carb white sauce pizza at ALDI. They carry all the necessities to stick to a low carb diet. I hope this recipe will become your new favorite crust for making low carb pizza. I shared the original pizza casserole recipe with my sister and she’s been making it several times a month now. Most people use a red sauce when making pizza. But, I’ve always preferred the flavor of a white sauce. Adding fresh sliced tomatoes on top are a great way to keep the tomato flavor. And, it goes great with the bacon, spinach, and cheese. 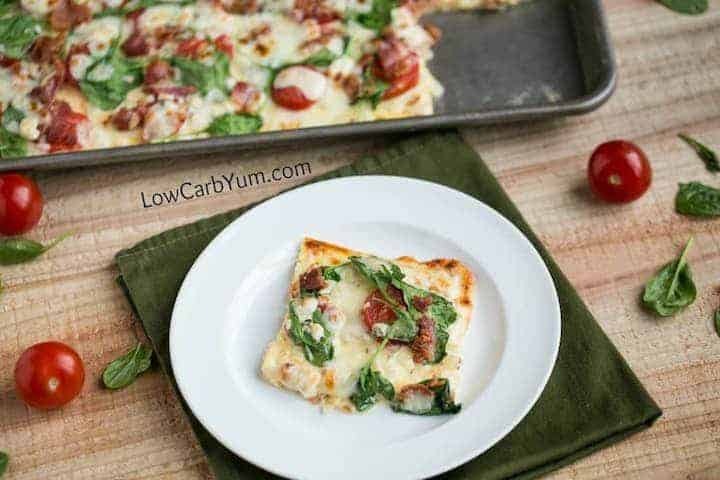 The best thing about this low carb white sauce pizza recipe is that it uses commonly found ingredients. So, you won’t have any trouble finding them locally. 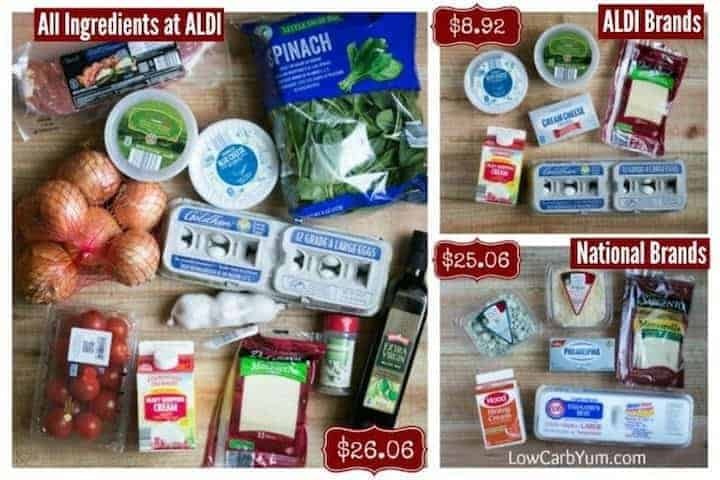 If you’ve just started low carbing or have been eating this way for a while, ALDI is a fantastic spot to save money quality low carb ingredients. I always get the best prices on eggs, cheese, meats, and low carb vegetables. 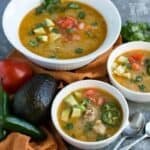 Low carb foods don’t have to break your budget. You just have to be a smarter about where you shop. And, when it comes to food, higher prices don’t always mean better quality. ALDI is a place where you get high quality foods at great prices. Give it a try and see for yourself. 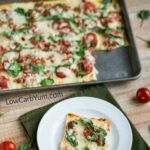 An easy to make low carb gluten free pizza crust that bakes up right in the pan with no rolling required. Top it with white sauce and veggies for a delicious treat. Preheat oven to 350°F. Grease 10x15-inch rimmed baking pan. In food processor or with electric mixer, combine cream cheese, eggs, heavy cream, and 1/4 cup Parmesan until well combined. 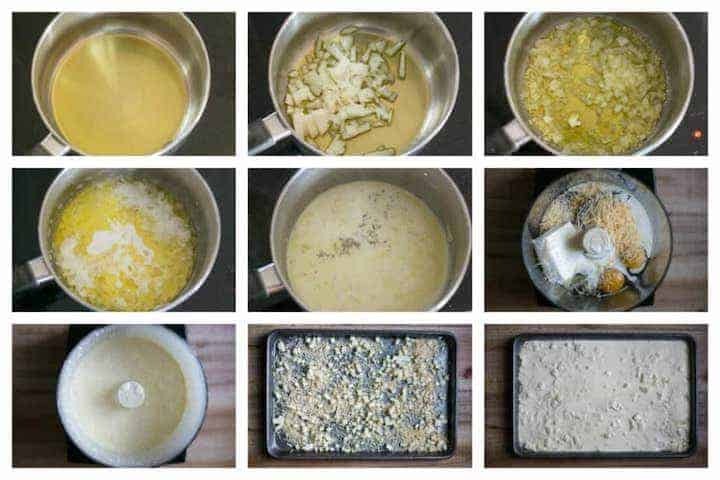 Sprinkle 1 cup Parmesan cheese and the mozzarella cheese in the bottom of the greased baking pan. Pour egg mixture over the cheese. Bake for 25-30 minutes then remove from oven. In medium saucepan, heal olive oil over medium heat. Stir in garlic and cook an additional minute. Add the cream and cook on low medium heat for about 3-5 minutes until cream has thickened slightly. Sprinkle on mozzarella cheese and optional toppings. Broil on high until cheese has browned.